Rainy Day Thoughts: Up to Date? Life comes with no guarantees for how long it will last and each of us should live as though today is the only one we have. Sure we must make plans for the future, but truly we never know at any age that there will be one. The lesson was taught me early on. I had a cousin, Sharon, who was especially close during my growing up years. She is the blonde with long hair in the picture of all us cousins. 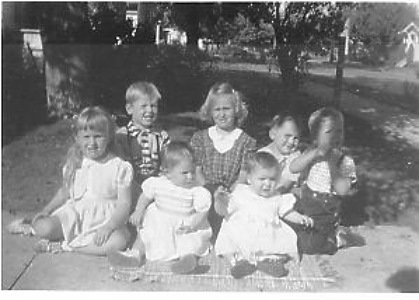 I am the dirty blonde in the plaid dress squinting into the sun. Sharon, as we both grew up, was the one I would take walks with when we were at family gatherings (which were pretty much every holiday) and tell each other stories, each taking a part of the action. She's the one where we once played in a Salem park and told the other kids we were the children of Roy Rogers and Dale Evans. They believed us too-- maybe. She's the one we would all play Mousketeers, a popular program when we were young, and we'd swing off the tall stack of hay bales with the rope bar yelling who we each were and she'd always let me be Annette-- or was that a case of let since I was the older! Sharon lost her beautiful mother when she was a child and that might have made us even closer. She is the one I had sleepovers with, and we'd talk into the night about boyfriends. She was my best friend through high school and then college. When I got married, she was the one I wanted for my maid of honor. But after marriage, I moved to Tucson for awhile, I came back pregnant, then there were babies. She got married. We drifted apart and rarely spoke except at family gatherings and then it wasn't the same. I couldn't go for walks with toddlers to look after. Maybe I could have and just didn't make time. We were both busy. We didn't live close. I assumed we'd have time to get closer someday again. When I heard she had the flu and had been hospitalized, I had no idea how serious it was. It seemed almost instantly she was dead. What she had had was a staph infection that dissolved her heart. The shock was one I still feel today. She was young, strong, beautiful, a new teacher, not married long, how could she be dead? Why had I put off spending time with her? She still comes to my mind every so often. Time runs out so quickly. I heard another of those stories from a friend last week when her niece, 25 years old, died suddenly-- again from an illness that came to her with no warning and little time to realize this was it. The lesson from what Ronni wrote is the same one I believe in totally and often forget just as quickly-- live up to date. Don't put off anything you don't have to delay. With my children and my brother, whenever I talk to them, we say we love each other when we end the conversation. It's not out of insecurity that one of us will be dead before the next chance to talk but more out of knowing that it strengthens living to be up to date, to not put off such words for a more opportune time. We can't live in fear of someone else dying because it would incapacitate our living. There will always be times we put off getting together with someone because we are busy. That's human life, but if we live up to date, as best we know it, we don't have to live with fear. We will know we did the best we could. That's all anybody can do. Currently wars, terrorist attacks, diseases seem to be growing in strength, and tthen there is global climate changes. We can't live fearful of such, but we can live for today and make the most of what we do have. It's a good way to live in any time. I suspect that even when there has been no recent event that teaches this lesson, most of us know it, but there are so many distractions in our world today that we don't pay enough attention. Reminders such as yours and mine are a painful way to relearn, but such is human nature that we need to be brought up short to keep what's important in sight. Thanks for mentioning Ronnie's site today. I haven't been there for about a week and it was moving. How impermanent everything is--including us. Sorry for the untimely death of your cousin--and the grief (and good memories) you carry to this day. Love the old photo. Exhausting day babysitting, but what gorgeous country this Olympic Peninsula is!Thanks for stopping by SO too. Is that not the truth! Both of my parents died suddenly, and so did my husband and a dear friend of mine. I still have things I wish I had said or done with all of them, but I have always been wide open with my feelings, and I NEVER let my loved ones leave without telling them I love them. THey may never get the chance to hear it again. I think this goes along with the idea of spending more time with friends & family instead of chasing after more & more dollars. Once you have enough dollars, recognize that you can never replace the time you spend questing after more. Back off. Smell the roses. Enjoy time with those you love. Your post made a terrific impact on me. It's an important reminder---especially at my age. Thanks for a moving story, Rain.